Amber Valley baseball team, 1946. Back row from left to right: Cliff Brown, Fordie Medlock, Horace Hinton, J. B. Brown, Alvin Brown, Alonzo Edwards, Ozzie Lipscombe. Front row from left to right: Booker Edwards, Arthur Saunders, Kenny Edwards. Athabasca Archives, 03237. 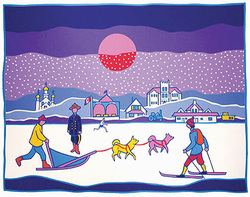 This signed limited edition serigraph depicts the Trans Canada Trail Relay meeting of the Atlantic, Pacific, and Arctic Ocean waters in Athabasca in March 2000. 18" x 22", $600 each, plus shipping. Cheques payable to the Athabasca Heritage Society. Panoramic view of the Town of Athabasca, 1913, taken by Voldeng and Bolton, Edmonton. Photograph courtesy of Athabasca Archives. Proceeds from the sales of these cards support AHS historic signage and Riverfront Site projects. Athabasca (1750-1890) is the first of three appliquéd fabric panels depicting the early Athabasca community. The Quilt Project is sponsored by the Athabasca Heritage Society, organized by Ann Stiles, and created by several quilters from the region. The theme for the second quilt is boom-town Athabasca (1891-1912) and the third quilt theme is area settlement (1912 onward). The quilts are on display at Athabasca University on the second floor of the Academic Research Centre and outside Governing Council Chambers on the main floor of AU Central. 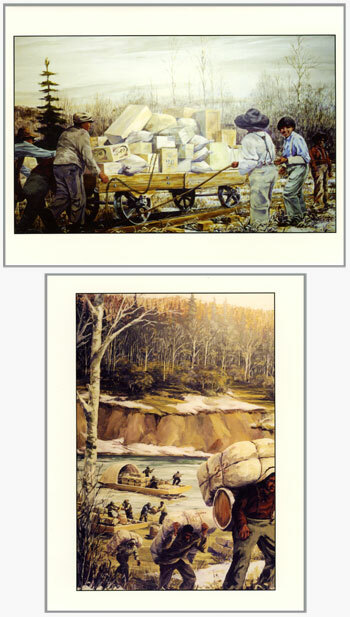 These cards show two views of the Athabasca Riverfront mural of packers unloading freight from scows and riverboats at Grand Island, and then reloading the boats past the treacherous Grand Rapids. A second mural shows trackers pulling fur laden scows up river to Athabasca Landing. These murals were created by artist Dennis Jacobs and were sponsored by the Athabasca Heritage Society and Athabasca University. Thanks to the Town of Athabasca, the Tourist Booth, IDA, Value Drug Store, Riverhouse, the Gift Shop at the Athabasca Hospital, Athabasca Health Foods, Old Crow Antiques, Boven's Jewellery & Giftware, and Whispering Hills Fabric and Crafts for supporting this project. For more information or bulk purchases, contact Margaret Anderson (margaret@athabascau.ca). Descriptive text guides visitors on a tour of Athabasca as they follow a map included in this 60 plus page booklet. Historic buildings and locations, numbered on the fold-out map, are identified with archival and current photos. $5.00. 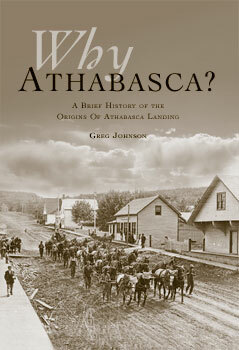 Written by historian Greg Johnson on the occasion of Athabasca's 100th anniversary, this compelling survey examines many long-held assumptions about the origins of the Town of Athabasca. Illustrated with maps and photographs gathered from Athabasca Archives and other sources, sixty plus pages of engaging commentary takes the reader on a journey through the fur trade in north central Alberta to the pre-First World War period. $15.00. 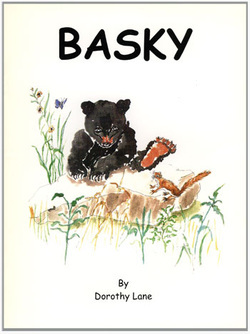 Basky: a perfect gift for a child you love who loves our natural heritage. The life of a local bear, lovingly told by Dot Lane and illustrated by Maureen Harvey. $10.00. Note cards, publications, carpentry aprons and canvas shopping bags with the AHS logo are available at the Athabasca CNoR Train Station. Publications and refrigerator magnets are also available at Athabasca Archives.